Complete dental examination and diagnosis: Oral examination is a complete visual inspection of the oral cavity with any necessary X-rays completed. The oral exam will be done under magnification to assess the condition of teeth, gums and underlying bone. 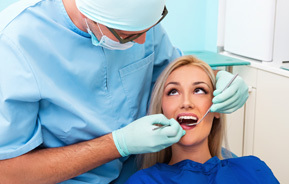 Dental Fillings: Dental fillings are used to repair damage to the structure of teeth. Damage can be caused because of tooth decay, dental injuries or trauma. The tooth is restored with several filling materials. These include dental cements, composite and gold. These fillings restore the function, integrity and morphology of missing tooth structure. Dental Crowns: A crown is a tooth shaped cap that is placed over the tooth surface to improve its appearance. Dental crowns can repair extensively decayed or damaged teeth. Dental crowns may be made from gold metals, silver metals, porcelain or a combination of porcelain and metal. Crowns restore the size of shortened teeth, eliminate sensitivity and improve the aesthetics of the teeth. Composite Bonding: Plastic material or resin material, which matches the colour of the tooth, is applied. It is then bonded to the tooth using a special kind of light. Bonding comes in different shades, toughness and translucencies to match the teeth. It is then used to fill cavities, eliminate spots, chips or discolorations. Dental Bridges (Fixed Bridge): A fixed bridge is an appliance made of porcelain to replace missing teeth in the most natural way. It is used to replace one or more missing teeth, thereby bridging the space between the teeth. Fixed bridges are cemented into place next to the surrounding teeth on either side of the space. Fixed bridges cannot be taken out of the mouth by the patient. Dentures: These are prosthetic devices constructed to replace missing teeth. They are supported by surrounding soft and hard tissues of the oral cavity. They are usually made from an acrylic base that is fitted with porcelain artificial teeth. Dentures can be complete or partial. Complete dentures cover the entire upper and lower jaw. Partial dentures replace one or a few teeth. Gum Disease Treatment: This involves a thorough dental cleaning by a professional dental hygienist with ultrasonic scaling instruments. Routine oral hygiene follow-up is done and use of an antiseptic mouthwash is used to rinse the mouth. Severe cases may need to undergo gum surgery. Root Canal Treatment: Root canal is the space within the root of the tooth which contains the pulp. If the pulp layer of the tooth is infected, then root canal treatment is needed. The decayed pulp is removed, the space is filled with a paste, and the tooth is covered with a crown. Root canal treatment is needed when the blood supply or nerve supply of the tooth is infected through decay or injury. It is done to prevent the formation of abscesses and eventual spreading of the infection to the surrounding tissues. Oral and Maxillofacial Procedures: These procedures include surgery to remove impacted teeth, difficult tooth extractions, extractions on medically compromised patients, and pre-prosthetic surgery for placement of implants. These procedures may also include diagnosis and treatment of cysts and tumours, temporomandibular disorders, congenital craniofacial malformations, chronic facial pain disorders and incorrect bite. Laser Procedures: Laser can be an effective way to perform many dental procedures. With lasers there is reduced need for local anaesthesia, bleeding is minimized, swelling is controlled, and there is little if any postoperative discomfort. Lasers enhance the effect of tooth bleaching agents for a faster and more effective result. Restorative materials are more quickly cured to greater hardness with the use of lasers. Lasers are also used to remove tooth decay fast and seldom require anaesthesia. Conclusion: The American Dental Association (ADA) recommends regular dental visits at least once every six months to ensure proper oral hygiene and dental function.